Dooney & Bourke has announced a princess limited edition collection sold exclusively at Disney properties or on www.disneyparks.com/store. The line will utilize the iconic princess images from the Disney royalty of Sleeping Beauty, Snow White, Cinderella and Belle. Every PrivyDoll is a princess inside! The collection is inspired by the D&B pop art collection and will incorporate images of crowns, castles and flowers. 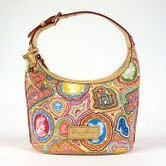 What a great bag for girls or for the princess in all of us! The collection is available starting September. Look for it on your next visit to a Disney resort or their website. This is their 5th collection with Disney and I anticipate it to be very successful once again!